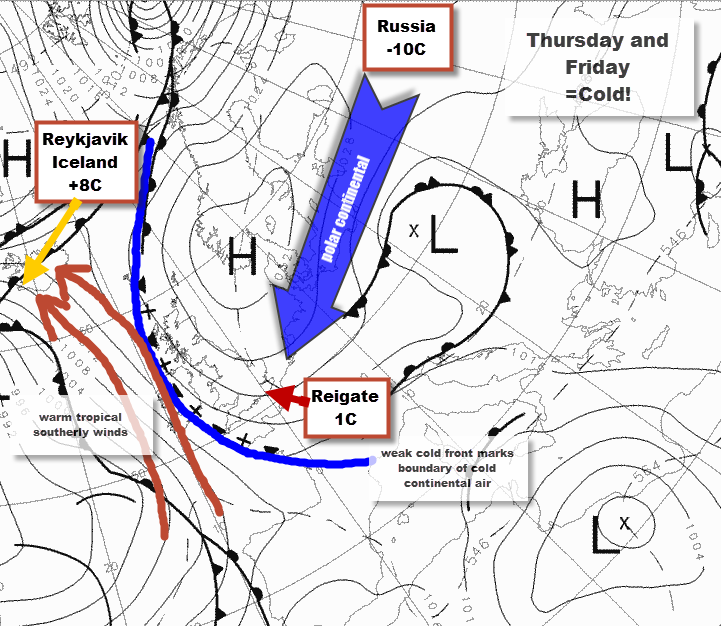 Get toasty…Iceland warmer than Reigate this week! 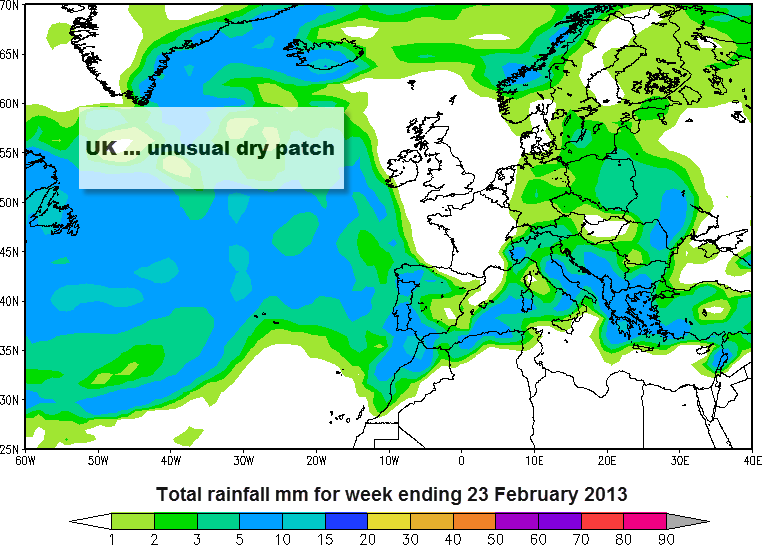 This week for Reigate: dry and increasingly cold! Watch the video which shows cold air (at 1500 metres) flooding in from the east. Wind direction is so important in controlling our winter and early spring weather: many of the “source regions” (where our winds originate from) are at their most extreme at this time of year: the continental interiors, for example, are at their coldest and driest in late winter, so any air mass coming from the continent will be very cold indeed, despite Spring being just round the corner. These cold and dry easterly winds contrast with our usual warm and wet SW Tropical winds that arrive from the Atlantic. This week it is the turn of Easterly winds and HIGH pressure to dominate our weather: this means cold and dry. The HIGH to the north east and the LOW to the south is a perfect set-up for dry and icy Easterly winds to flood across the South East, arriving from a very cold Russia on Tuesday and strengthening through to the weekend. It should stay dry with a low risk of snow flurries reaching Reigate. Actual max temperatures will be +1 or 2°C during the day but the 15 mph wind will make it feel very chilly at -3°C in the daytime and, during the night, as low as -8°C wind chill. Cloud cover will control how low air temperatures actually fall at night: clear skies could see temperatures drop to -4°C with frosty mornings. Want to warm up? Get to Reykjavik in Iceland which will be the warmest city in Northern Europe this week with unseasonably high temperatures of +8°C with a “warm” and wet southerly Tropical wind. Next week looks warmer and staying dry for Reigate with temperatures up to 10°C. An early taste of Spring perhaps? 2 responses to Get toasty…Iceland warmer than Reigate this week! -2C, in winter. Steady now….